When the original Kingdom Hearts was first announced back in E3 2001 everyone was freaking out. I mean seriously, combining Disney characters with Final Fantasy characters to produce this crazy super universe was such a risky idea that people had serious doubts about it working. To top that off, the main weapon of the game was a giant key which made me have serious thoughts on whether Testsuya Nomura lost it while working on Final Fantasy X. However to everyone’s surprise ,that idea sparked a great series of games that went on to become one of the most unique JRPGs on the planet. Birth By Sleep is a prequel to the original Kingdom Hearts game and provides a massive back-story to the events that occurred in original title. I highly recommend having played at least both Kingdom Hearts I&II or planning on doing so right after finishing the game in order to fully enjoy the beauty of the story. The story follows three keyblade wielders: Terra, Ventus, and Aqua in their quest to stop a group of creatures called the unversed from wrecking havoc onto the world. In order to accomplish their goal, they travel to different worlds that include a mixture of famous Disney productions. During your travels from one world to another, you will encounter characters from both the Final Fantasy and Disney universes. The game breaks down the story into 3 parts, each following one of the 3 main characters in the game. This basically means that once you start the game you get to choose which character to play the game with for that save file. I was hesitant at first as to how diverse each main character is in comparison with the others .However after finishing the game with all three I am amazed at how diverse each of the characters are in terms of both story and gameplay. The gameplay of Birth By Sleep is its biggest strong point next to its rich story. The battle system stays true with the original Kingdom Hearts formula but provides some refinements that makes it arguably the best in the series. The controls are simple, you tap the X button for a normal attack, O button to jump, square to evade, and the triangle button to choose a command from the command menu . The Command menu is where all the items /magic/skills are placed, and can be customized according to your own preference. The commands themselves can be leveled up as you use them through the game and can later be merged to create different and more power commands. Once you have used up a command in battle, it goes down the list and takes a while for it to be usable again. The stronger a command is the longer it takes to recover which introduces the element of knowing which command to use at what time. This provides a new sense of depth that other games in the series lacked quite a bit. The game introduces something called a command style which is similar to the “Drive Form” from Kingdom Hearts II. During the command style mode you will be unleashing a series of devastating attacks that deal a lot more damage than your usual moves. In order to enter a style you must fill a bar located under the command menu by hacking and slashing enemies. Once the bar is filled you can enter a command style by executing a command that attributes to a certain elemental attack. For example, if you used blizzard then your character will go into the “Diamond Frost” command style. Birth by sleep gets rid of party members and instead uses the “D-link” system which enables you to link your character to other people you meet throughout the game. Once the D-link gauge is full you can activate D-link by pressing right/left on the d-pad and selecting which character you want to link with. This opens up another very useful element to the game as using “D-link” fully restores your characters health and gives you access to the command menu of the D-linked character. 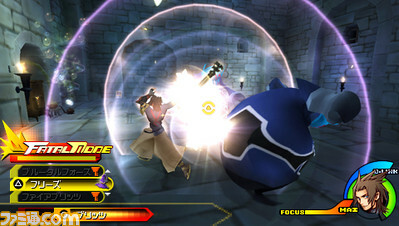 The final element in the gameplay of birth by sleep is focus attack. In order to perform a focus attack you need to press and hold the shoulder buttons which locks on to the enemies on screen. Once the screen says MAX you then release the shoulder buttons causing damage to all enemies on screen. Focus attacks provides a great way to deal damage while avoiding any and can provide a huge amount of help beating a group of enemies or a really hard boss fight. The game also adds in a multiplayer aspect called the Mirage Arena. The Mirage Arena contains a series of levels that puts you up against countless rows of enemies in return for various prizes such as items and commands. Within the Mirage Arena you can choose to solo the arena levels or play with other people over ad-hoc and even D-link your characters with each other to be used in-battle even outside of the arena. Birth by Sleep includes a couple of fun mini-games, most notably the command board. The command board is a board game that you can play outside of battle which gives you rewards such as leveling up your commands and giving you new ones. I have to admit that the command board is pretty fun to play and I actually enjoyed leveling up my commands rather than just doing it for the rewards. In terms of visuals, the character models are really impressive for a PSP game. The models are extremely detailed rivaling that of the quality of Kingdom Hearts II on the PS2. However the environment and worlds you visit felt very small and blunt. There was simply not that much detail put into the environment of the game and each world includes a maximum of around 8 areas that you can explore. This isn’t a deal breaker, but it does make the game suffer from the issue of lack of exploration which was a pretty great thing about previous entries in the series. The soundtrack of Birth by Sleep is fantastic! But that’s just because Square Enix decided to take tracks from Kingdom Hearts I&II and just throw them in the game. The soundtrack still fits Birth by Sleep properly but just using previous tracks entirely makes me feel that Square Enix didn’t put that much work into this game’s sound aspect. The voice acting on the other hand was a great job well done. There are lots of big names voicing the English version of the game, and they all do a fantastic job of bringing these characters to life. The game still holds quite well despite the two main issues with the environment detail and the repeated soundtrack from previous entries. It took me around 10 hours to finish each character’s storyline, but the Mirage Arena and the search for unlockables will keep you going for quite a while. Birth by Sleep is easily one of the best RPGs on the Playstation Portable and a great game for both fans of the series and newcomers. -	While the game does have fantastic character models, it does lack detailed environments. -	The best in the series, Birth by Sleep added a lot of depth not found in previous entries. -	Great voice acting, but using previous entries’ soundtrack almost exclusively adds a sense of repetition. -	The game is a complete Kingdom Hearts experience on a portable platform that boasts at least 30+ hours of gameplay. Note: Scale is out of 10, and the overall score is not an average of each category. I finally found something that I really enjoy and am proud of doing starting as a series of reviews. Please look at the review, write any criticism you have about the review. I am pouring a lot of effort into this so please spare some time to help me here TL. I hope you enjoy reading the review! I was not disappointed reading this. I'm fairly skeptical of Kingdom Hearts' merit (like you said, mixing Disney and FF is a risky proposition), but the series really does seem to have excellent gameplay. Maybe I'll take a chance and pick up one of the earlier titles sometime. Thanks for the entertaining read, DragoonPK! Your first installment was, I'd say, very well done. Aside from (admittedly frequent) grammatical errors (I'm quite nitpicky in that regard), I couldn't detect anything blatantly strange/inaccurate/otherwise misplaced. I felt like I learned most of what I needed to know to make an informed purchase, and that's the goal of a review... so good job! Thanks! Need to work on that grammar! Just a question, other than grammar : What makes a more professional review say like IGN better than mine? I am trying to find out what am I lacking to reach that level, so I hope you can give me some insight? If I hadn't already bought this game, this review would have convinced me to buy it. Good work dude. Hmm... I'm not exactly a fan of IGN, so my bias there might hamper the advice. That being said, don't think that I'm telling you not to include your own thoughts... just try and avoid casual "gamer" writing, and squeeze more analysis in there. It's fine to have your opinions, but for me at least, it's slightly irritating when reviewers don't speak with authority. I'm supposed to be learning all I need to know from these people, so lackadaisical tones are generally indicative of an "I'll tell you what I think" attitude. I don't want that attitude: I want an "I'll tell you what you need to know" attitude, and more formal writing tends to make me favor one review over another. - It's not necessary to explain the controls like you did (i.e., which buttons do what); instead, tell us the fundamentals of gameplay, whether or not the controls are fluid, and other, more broadened, aspects of design. - A stronger format would help make your review more aesthetically pleasing. Don't just move right into the next topic; partition out the subjects you're talking about. Have sections for the overview, the basic plot (emphasis on "basic"), controls, gameplay, graphics, sound, and the like. Basically, make a different section for each rating you give at the end. That's what I could come up with offhand. Hope it helps! Thanks for the insight ! I will look into improving as much as I can! After reading the above posts, I feel like I don't really have much to add upon what has already been said other than that I noticed you didn't put a score for the story or presentation. You may have combined it in with Gameplay but you described it very vaguely. I sometimes skip the entire review it self and get the "tldr" in the score at the end for only a brief overview on whether the game merits a playthrough as I prefer to be pleasantly surprised. 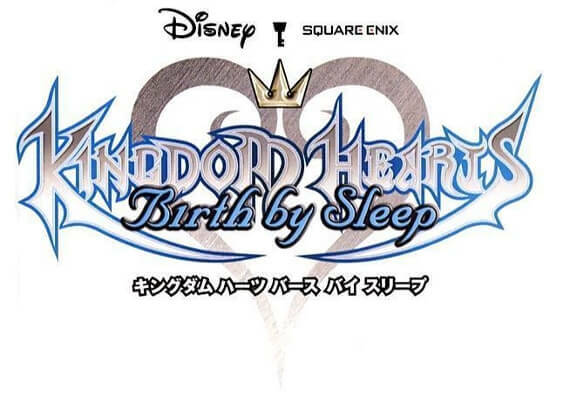 omg i read that as kh birth by sheep for a second. Come on people I need more opinions on this, just 6 people? I know there are more of you out there! I was never a big JRPG fan but this review would definitely have convinced me to play the game if it wasn't a prequel to a game I haven't played.